The hit CBBC dance show returns to the stage with original choreography from the series and never-before-seen dances. The newly announced The Next Step Wild Rhythm tour features amazing duets and captivating solos from the talented cast, as well as full-throttle, explosive routines featuing the whole crew. Guaranteed to capture the attention of the entire family, this interactive show features cast members Victoria Baldesarra (Michelle); Trevor Tordjman (James); Jordan Clark (Giselle); Taveeta Szymanowicz (Thalia); Isaac Lupien (Eldon); Myles Erlick (Noah); Briar Nolet (Richelle) and newcomer Isaiah Peck, who will star as Henry in season four. 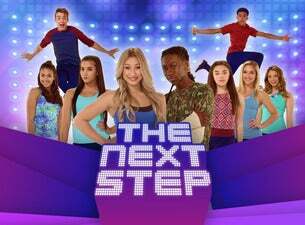 To immerse themselves in the world of The Next Step, UK fans of the hit tween drama can catch new episodes of the series on CBBC. The A-Troupe dancers are currently on a quest to be named International champions, but must overcome unexpected challenges as they approach the competition.